Staying inside the four corners of your house does not protect you from pollution and other air contaminants. If you are utilizing your heating and cooling system, a lot of air contaminants and pollutants are being dragged by your air duct system. With the passing of time, these harmful substances that include dusts, allergens, bacteria, germs, molds, and mildews will start to thrive inside your air duct. They will circulate around your residence, posing threat to you and your family’s health. If you want to avoid such problems from happening, it is important that you get a professional duct cleaning in Overland Park, KS right away! 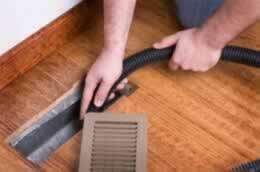 Our company has been in the service of duct cleaning in Overland Park, KS for many years now. Our services do not only guarantee that your air ducts will be cleaned thoroughly but our professionals will assure you that your home will have fresh and quality air. Cost-Effective and Greater Efficiency - Duct cleaning in Overland Park, KS will help in increasing the efficiency of your heating and cooling system while reducing the cost of your energy consumption. Better Indoor Air Quality - Overland Park, KS duct cleaning ensures that all air contaminants and pollutants will be eliminated from your home. Without these harmful substances, you are assured that the air you breathe is safe and fresh. Prolonging Air Duct System’s Life - Regular duct cleaning in Overland Park, KS significantly boosts the life of your device. It reduces the crack risk of the heat exchangers. Heat exchangers usually crack if the fan inside the air handler has dirt and dust. Dirt and dust accumulation lessens the air that the fan produces to cool down the heat exchangers which cause it to crack.